Maybe daring title but the whole point of this How To is to show how you can use subtractive in the right way - if you really need it. It doesn't matter if you start from Additive or Subtractive - you can still use subtractive way of work. Consult Additive vs. Subtractive Level for more information about pros&cons of both. Generally there is nothing good if you start Subtractive except you like that style of work. UT3 (or Unreal Engine 3) is Additive all the way - and Subtractive is only emulated with big blue brush around the whole grid area - you have to zoom really far in orthogonal viewports to see edges of the grid area. So how to make subtractive levels without this brush? Make your own blue brush that is smaller - just big enough to encompass your level. That preserves the subtractive workflow without inherent flaws caused by the big blue brush. Zoom out to locate this brush - or find it in perspective viewport when it's switched to wireframe. 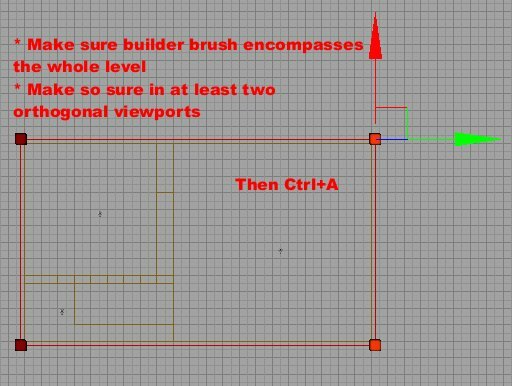 Adjust box of the builder brush in Geometry mode to encompass the whole level. Create an additive brush (Ctrl+A). RMB on the brush to view context menu. Now rebuild at least geometry and check it out in perspective viewport. You have to go inside your new blue brush to see rooms there. Use transparent texture for outer walls. You will still have problem with selecting faces inside. Make your blue brush bigger so it encompasses not only the level area but also the space where you tend to place your camera as well. Still much better than original brush. Get used to it and use your camera more inside. This is how you can work in a subtractive way with UT3 while avoiding few disadvantages of the original Subtractive solution. Main problem was - of course - long lighting build times. For the simplest level it took over a minute to build a level. After making the blue brush smaller it took under 3 seconds on the same machine. On slower machines this difference becomes even more clear. You still have other problems resulting from Unreal Engine 3 being additive engine. You have to keep blue brush First at all times - so after you rearrange some yellow brushes To First, you have to check blue brush again and put it To First after those changes. If you want to check some levels that are created with this "subtractive" method I recommend DM-Subterrane by Hazel.H. It contains also some windows/holes to the outer world with a skybox which you may find useful.